In recent decades, the nasal and bronchial mucosa has become an established administration site for systemic as well as local drug delivery. For developing novel drugs intended for this route, reliable methods are needed for assessing the rate and extent of absorption across the nasal and bronchial epithelium. 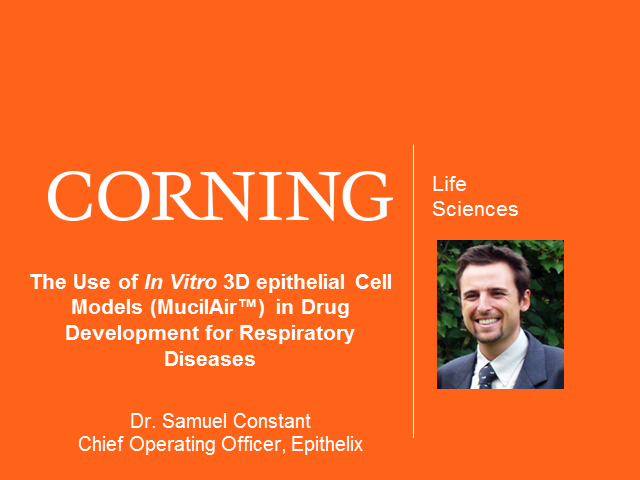 Epithelix has developed a novel in vitro cell model of the human airway epithelium named MucilAir™. MucilAir™ maintains the fully differentiated, morphologically and functionally, characteristics of the native tissues for more than one year. Using this system, the typical characteristics of the airway epithelium are observed (e.g. tight junctions, cilia beating, ciliated cells, basal cells, mucous cells, cytokine/chemokine/metalloproteinase release, active ion transport and CypP450s activity). Epithelia from several pathologies can be reconstructed (e.g. Asthma, Allergic Rhinitis, COPD, CF, etc.). Due to its unique long shelf-life, this model is used for studying the human respiratory diseases, and for testing the long-term/chronic effects of drugs candidates on respiratory tract. Several applications of MucilAir™ relevant to drug delivery, inhalation efficacy and toxicity assessment will be presented. For each application, specific examples of in vitro tests will be selected to highlight the Pros and Cons of using in vitro human airway epithelia for development of new drug candidates for respiratory diseases. In recent years, three-dimensional (3D) cell culture models have been emerging as the preferred in vitro cancer model as they better mimic the in vivo tumor microenvironment. For instance, 3D cultures develop hypoxic cores and demonstrate gradients of soluble factors and a diffusion profile for drugs similar to solid tumors. Understanding the interactions between cancer cells and other cell types in the tumor microenvironment is also critical to predicting therapeutic efficacy. •Several 3D cancer models and technology tools used to better capture the complexity of the tumor microenvironment in assay-compatible formats. Audrey Bergeron is an applications scientist for Corning Life Sciences. She evaluates new products and develops protocols and technical documents using Corning cell culture products. She also provides product training to Corning employees and customers, and assists technical services with customer support by helping to troubleshoot customer experiments.